Some Good News for Ignace, Ontario! We’ve got some good news to share with Ignace and surrounding area residents: the town’s sawmill, idled in 2006, had its inaugural reopening on February 10th. Attended by Resolute’s President and Chief Executive Officer Richard Garneau, the town’s mayor, Lee Kennard, sawmill employees, local media and invited guests, it was a celebratory affair! The Ignace reopening means 90 new jobs for the area, and certainly additional indirect jobs as the sawmill’s operations ramp up. 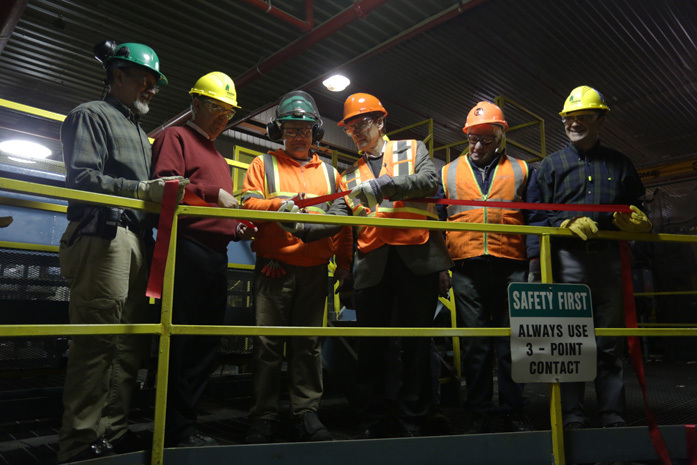 It’s all part of Resolute’s C$90 million investment in Northwestern Ontario, which also includes the construction of a new sawmill in Atikokan, a production capacity increase at our Thunder Bay sawmill and the building of a wood pellet plant at the same location. When all these initiatives are completed, there will be a total of 200 new jobs at these facilities and an additional 200 woodlands jobs created. Getting the idled Ignace mill up and running again meant installing dry kilns and making a number of upgrades to existing equipment throughout the site. The result is an increase in the mill’s annual production from 85 to 115 million board feet. And timing is good! Growth in both the U.S. residential construction market and GDP will mean an increased demand for our products. Plus, the U.S. market for softwood lumber is expected to continue to grow over the upcoming years. With these investments, Resolute is well positioned to take advantage of new growth opportunities.